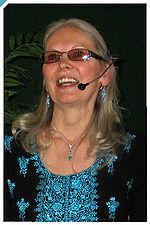 Karen Zerby is administrative and spiritual co-director for The Family International. She has been a part of the movement ever since back in 1969, she has written many articles concerning Christian faith life. Karen was born on 7-31-1946 in Camden, New Jersey. Karen Zerby first became acquainted with the organization (known then as the Children of God) in 1969, while living in Tucson, Arizona and later joined the group in Huntington Beach, California. She first was a secretary for the groups founder, David Brandt Berg (1919-1994), and later became his wife and trusted companion for the next 25 years up until his death in 1994. Karen took on the over seeing of the "Family International" following the passing of David. Steve Kelly, her present spouse, shares the duties of spiritual and co-administrative director. Karen manages the inspirational writings which are at the base of Family devotional and theological studies. This page was last modified on 12 September 2012, at 08:27.